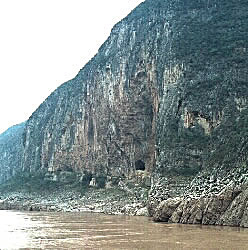 Within a half hour of leaving we would enter the Quatang Gorge, the last and smallest of the Yangtze's Three Gorges. Unfortunately the weather wasn't cooperating and it was approaching dusk so the pictures aren't at all spectacular, in fact, they're just passable. As a result I won't bore you with to many of them. 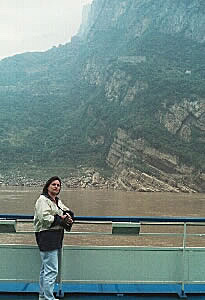 All along the Yangtze and the Da Ning rivers were signs of ancient Chinese civilization. One of the more interesting ones was the hanging coffins (picture left). These date back approximately 2,000 years when the custom was to bury the dead in caves along the shear rock cliffs along the gorges. 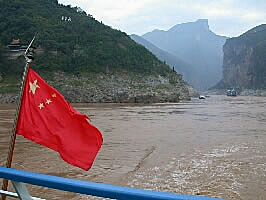 This picture was actually taken on our excursion up the Da Ning River as it was one of the more easily spotted coffins. Many weren't evident to the naked eye and you needed binoculars to see them, but this one could be made out with the naked eye. 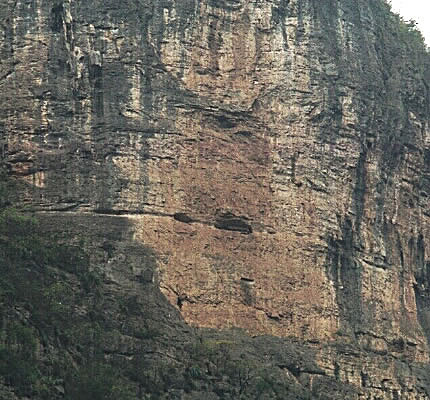 You would also see holes in the side of the rock face cliffs where wooden planking was placed to form a footbridge along the cliff face. It was from these foot bridges that the peasants would pull the boats and barges upriver. 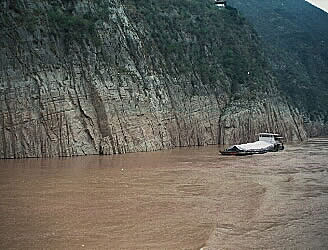 From what we read many died in the process when they lost their footing and fell into the ragging Yangtze River. 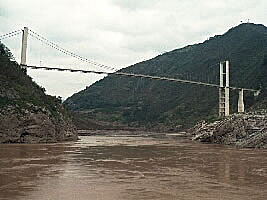 There were some places where these bridges were still being used today.